I had initially planned for this run to be a goal pace run to prep me for Tom King three weeks later. This meant a finishing time of 1:36:00. In the weeks leading up to the race, I felt pretty good about this. I had run 1:37:37 in training, which wasn’t too far off. And then the Cedars Frostbite Half happened, and I had no idea what to do with my goals for the rest of the year. I ran the 15k distance in that race in 1:34:09. 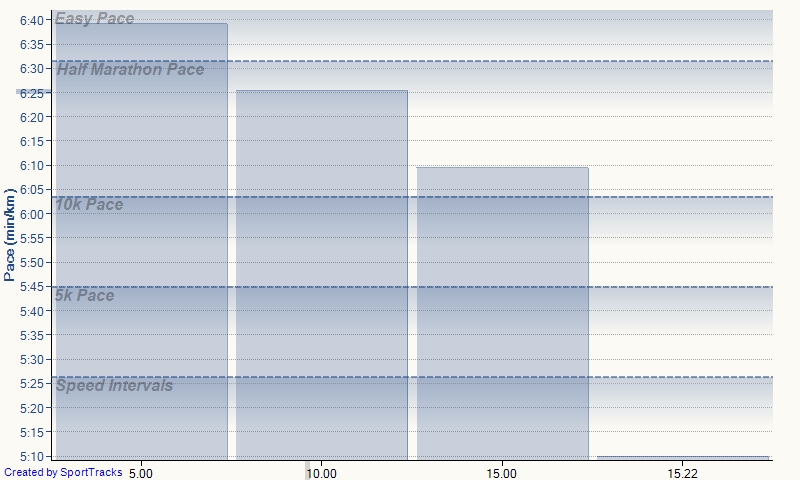 Since I had run so hard just a week earlier, should I even attempt a goal pace run? I finally decided I would just run it and not be concerned. I threw all goal times out, except that I did want a PR because I figured that would be fairly easy to do. I got up bright and early at 5am. My cousin Gillian was running the 5k and we were carpooling downtown, so she met me a little before 6am to head down there. 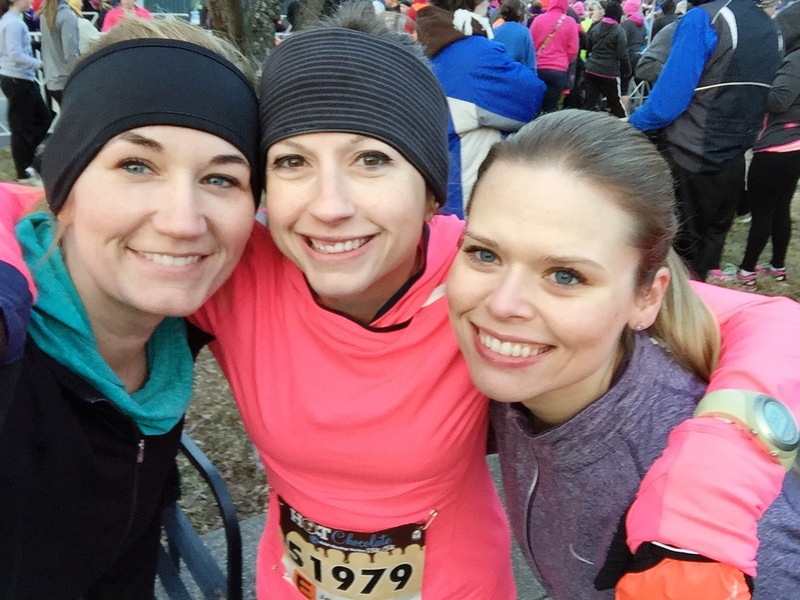 Unlike last year, Amanda actually remembered to sign up for the race this year! We met up with her in the parking garage and all walked over to the park together. We were all assigned to different corrals but decided to start together, so we chose to begin from my corral, E. It took about 15-16 minutes to reach the start but soon we were off. For the first two miles, I ran with Gillian. She was aiming for a sub-30 5k, so we were going about the same pace. It was a little congested at the start, so there was a bit of weaving around people. The second mile also brought the massive Rosa Parks hill that we ran up last year as well. So these miles were a little slower than she was planning. The 15k runners and 5k runners split off during mile 3. I wished Gillian good luck and made my way down Church Street. 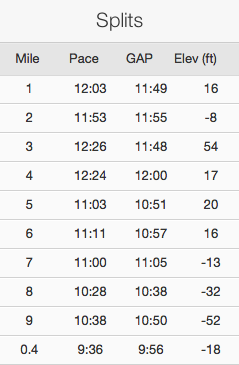 I think my watch had a few snafus during mile 2 and decided to even them out in mile 3; I’m not convinced I was actually running a sub-9 minute pace, but I about panicked when my watch beeped and showed that pace. Way too fast! I stopped at a water station on mile 4. They were offering marshmallows as well, but I opted for just the water. Soon after, we entered Centennial Park for a couple miles. I enjoyed the out-and-back sections through the park as they allowed me to look at the oncoming runners and see if I could spot anyone I knew. I never did, but it was distracting nonetheless. Once we left the park, there were less than three miles left. I was pretty exhausted by this point and ready to be done, but I pressed on. I had forgotten to eat something that morning and my stomach was growling. I tried to take a chocolate marshmallow at the last water station, but ended up dropping it. On the last mile, I took one non-water station walk break. I just needed a little more energy to finish strong. As you can tell, I had no real final push in my step. I did, however, manage to pose for my finish photo. 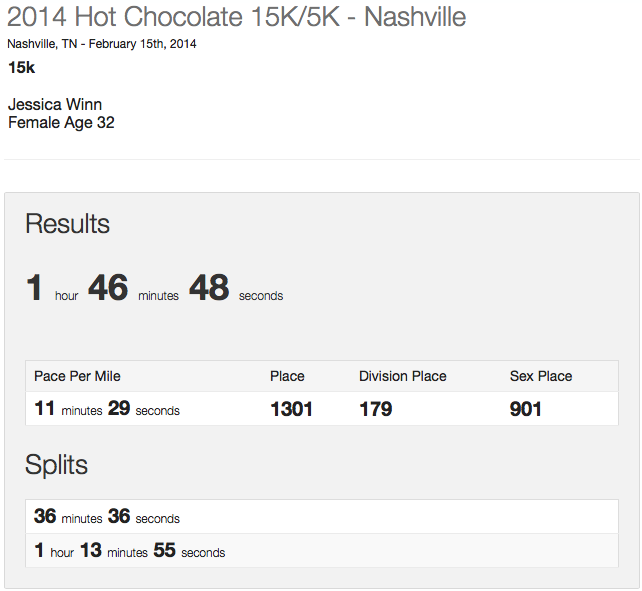 I was extremely happy with my time for this race, especially considering I had just PR’d the half last weekend. 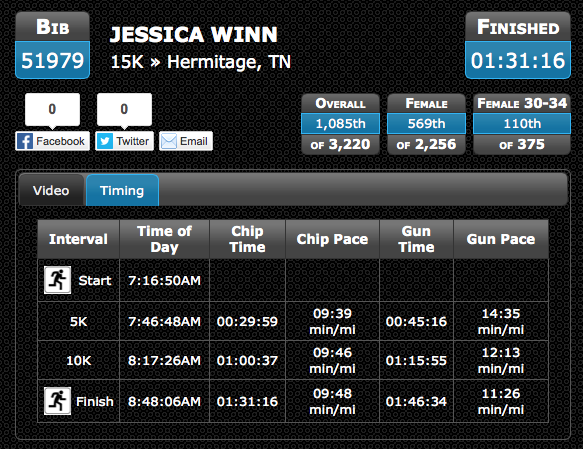 I took 15 minutes off my time from last year! I met up with Gillian after crossing the finish line. She had gotten her sub-30 goal and finished in 29:45! 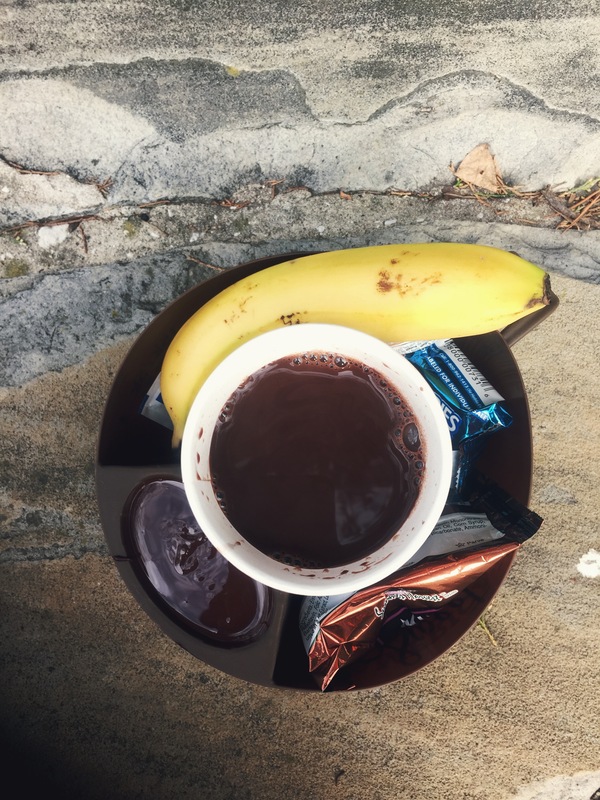 After downing my hot chocolate and fondue, we began our trek back to the car with frozen fingers. 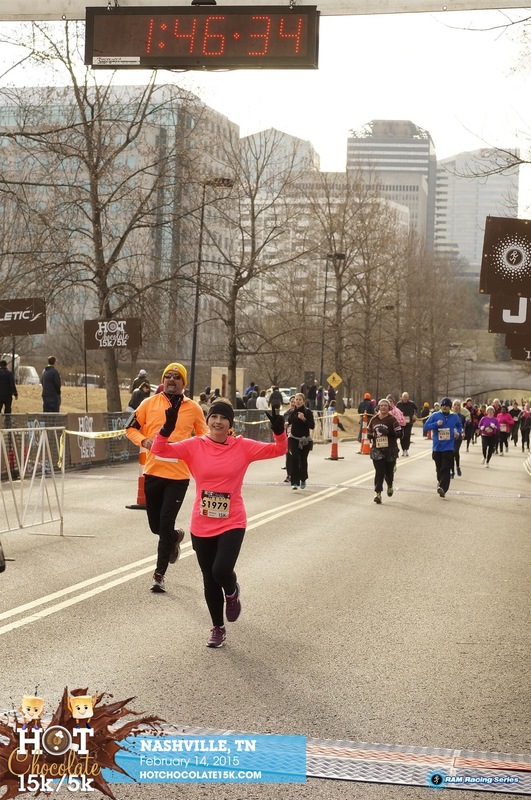 This race continues to be one of my favorites despite the weather always being dreadfully cold. It is so well-organized for a race its size. Smaller races could learn a lot. The swag was great this year, just like last. We got zip-up hoodies, which are super warm and comfy. The race name is stitched onto the front. The bonus this year was that all 15k finishers got a medal! 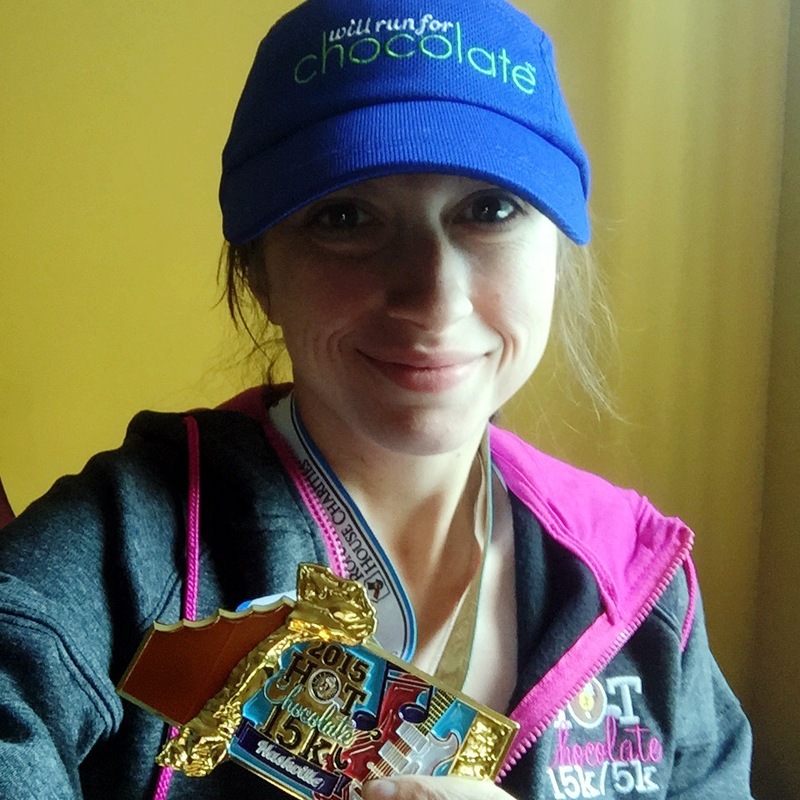 I also managed to get a “will run for chocolate” running hat in my bag. I should have thrown some makeup on before taking this. Sorry. And the post-race food is amazing! It was the same as last year’s, but that is in no way a complaint. I didn’t keep my mug this year, since I already have one that is collecting dust. This was my third race in a row of running by feel instead of by watch. I continue to amaze myself at what I can do when I’m not entirely trying. I even bested my 10k time from last November, and you remember how amazed I was at that time! Overall, this was my best race to date, time-wise. I wish I could have finished a little stronger, but without really tapering or anything, I am still pleased with my performance. The race started out with some bad news. Amanda texted me on the Wednesday before the race to ask what day we had signed up because she couldn’t find her confirmation email for packet pickup on Thursday. I searched my email and told her it was July 19th, but they had sent out an email last Friday with a link to use. She said she didn’t receive that. I started joking around with her that she had never actually signed up. But when she tried to log into their website to view her confirmation it soon became clear that she had never actually signed up. I teased her about it and figured she would just go ahead and sign up since registration was still open. On Thursday, I texted her to ask about meeting her for dinner after packet pickup. She said she wasn’t coming up because she wasn’t running. Say what? She said she couldn’t afford it and refused my attempts to pay for it. So, I sadly lost my race buddy, which super bummed me out since running a race and having no one to share it with at the finish line is not really fun at all. The weather was forecasted to be in the 20s on Saturday morning with a windchill of around 12. (Whyyyy?) 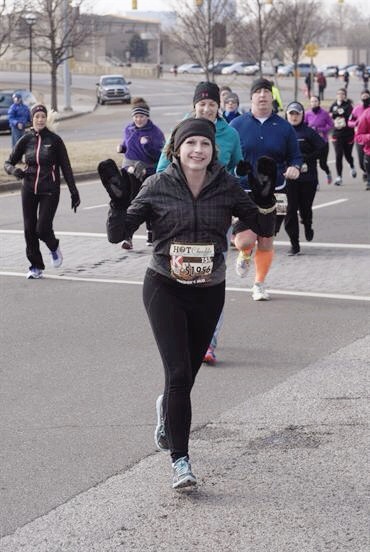 So I opted to wear running tights with compression sleeves under them, my long-sleeved half-zip with thumb holes, my new Brooks jacket, mittens, and my earwarmer headband. I also decided last minute to wear my Skechers; the tread is running a little low on them, but it’s not completely flat and the midsole seemed fine. I knew they wouldn’t give me blisters, and that’s all I cared about. I went to bed the night before with a bit of a stomach ache. I don’t know why it was hurting. Jonathan and I had decided to postpone most of our Valentine’s celebration until after the race, so we had just ordered pizza. No alcohol. Nothing unusual. I woke up the next morning still in pain, although it wasn’t as bad as the night before. I downed some Pepto-Bismol and hoped that it would subside. 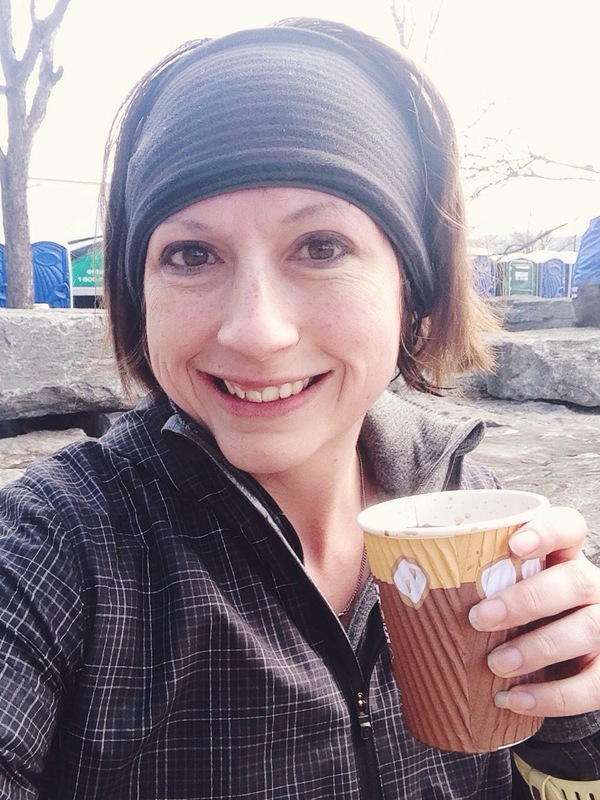 I was imagining having to write a blog post on having to quit the race halfway through due to stomach issues. I arrived in downtown Nashville around 7:30 am for the scheduled 7:55 start. It was so cold and starting to snow. I spent about 10 minutes lightly jogging and trying to warm up, but the entire time I was standing in my corral, I couldn’t feel my fingers or my toes. 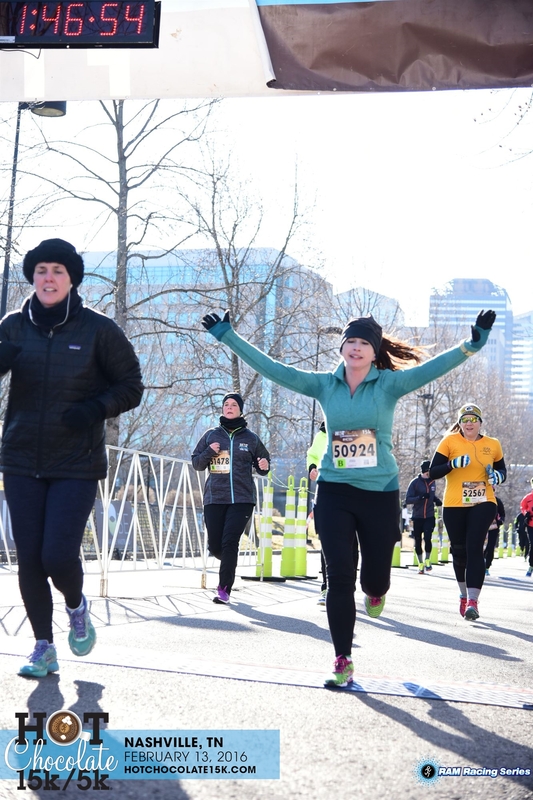 I thought to myself, “Never ever ever let yourself sign up for a winter race again!” I was in K corral, which was two corrals back from the start (A-H were for the 5k). We were sent on our way a little after 8am. My goals for this race were pretty simple. I knew that I could easily do it in under two hours. I would be greatly disappointed if I went over that time. But I was really aiming for about 1:50, which would tell me that I was on track with my half marathon training (with the goal for that to finish in 2:45). I decided not to do structured intervals, but just planned on walking through water stops and on uphills. The way the course is laid out, the first two miles are fairly flat. 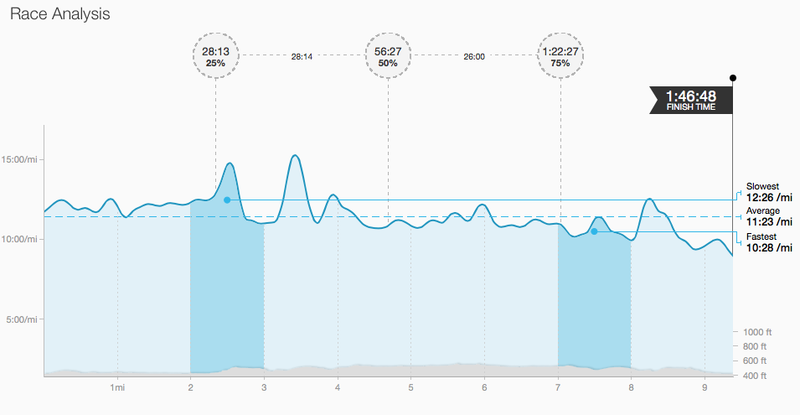 Then you get four(ish) miles of mostly uphill, then four(ish) miles of mostly downhill. Really good training for the Country Music Half, since it’s kind of similar and along some of the same route. The first two miles were pretty uneventful, although sucky in the way the first two miles always are. I warmed up pretty quick after we got going, so the cold stopped being an issue. 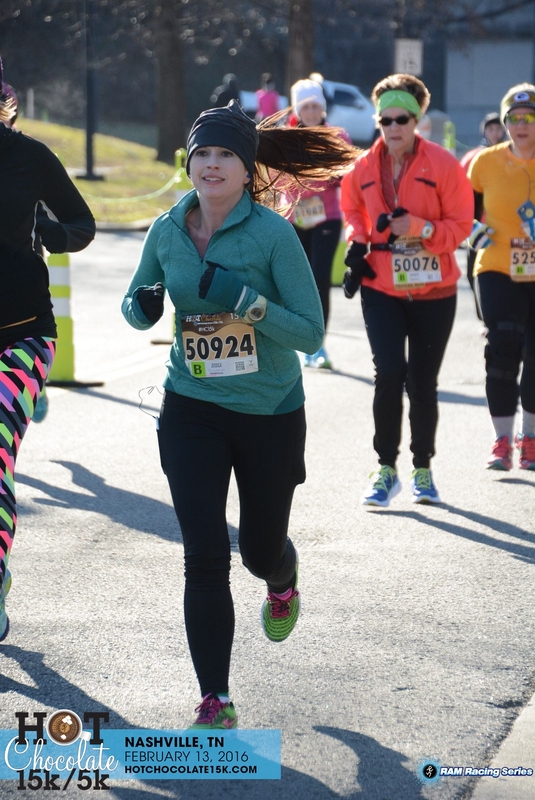 Just before the first mile marker, I got something stuck to the bottom of my shoe that was causing a big bump under the toes of my left foot. I thought I was going to have to stop and remove it, but it worked itself out after a few minutes. The first water stop was just after mile 2. It was so cold, all the water cups were filled with slushy ice. I dumped some in my mouth to let it melt and started running again. Soon after was the first big hill, which was the ramp on Rosa Parks. It was steep. It was so steep that I literally only saw two people attempting to run up the thing. Everyone was walking it. About a half mile after that was another hill. This one wasn’t as steep; it was just long. So I ran up part of it and then walked the rest. About a quarter mile after that, right before the fourth mile marker, was the second water stop. This is why you will notice that miles 3 and 4 were my slowest; this was most of the walking that I did. 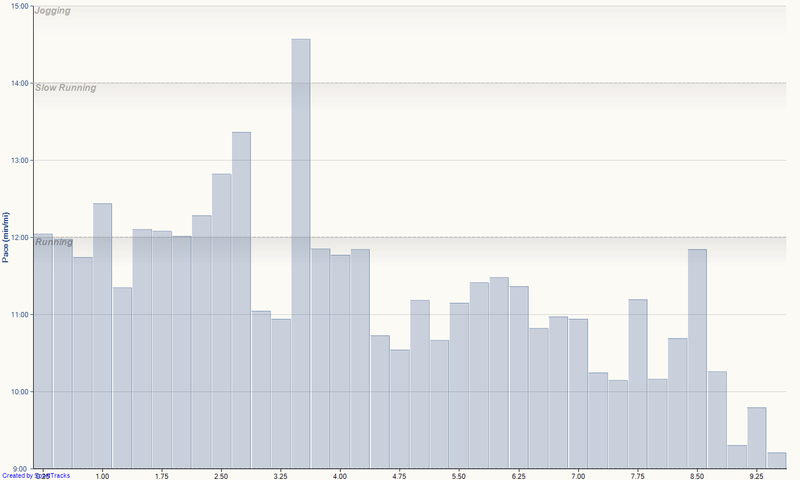 It was pretty steady for a while after that. Most of miles 5-7 were through Centennial Park, which is fairly flat. There was a turn around point just before the sixth mile marker that was on a hill, but I ran all of it. The third water station was just after that and they were also handing out chocolate candy. I hadn’t eaten at all and my stomach had been growling, so I took one. I unwrapped it and stuck it my mouth before I realized my mistake. It was 20 degrees outside and the chocolate was rock hard. I chewed it up as quickly as I could and then dumped some ice from the water station in after it to try to wash it down. Luckily, the discomfort of having chocolate stuck in my mouth didn’t last long, and I was soon running through the 10k point. I hadn’t been checking my watch very much, but I did look at it around 6.2 miles and realized that I had just ran my fastest 10k. “Huh,” I thought. I was feeling really good, so I decided to pick up the pace a little. More in my groove at this point! There were no stops from miles 6 to 8. There was the occasional rolling hill, but it was mostly a downhill trajectory, and I managed to average under an 11 min/mi pace with mile 8 being my fastest of the whole race at 10:28. The fourth and final water stop was just after mile 8 at the base of a hill. I took my last gulps of ice, walked part of the way up the hill, and then started my final mile to the finish. I ran mile nine in 10:38, with that mile marker telling me to pick up the pace even further because there was only 0.3 left. I pushed harder until I saw the mile 3 marker for the 5k, signalling there was only 0.1 left. I started passing people left and right, sprinting across at a 9 min/mi pace. 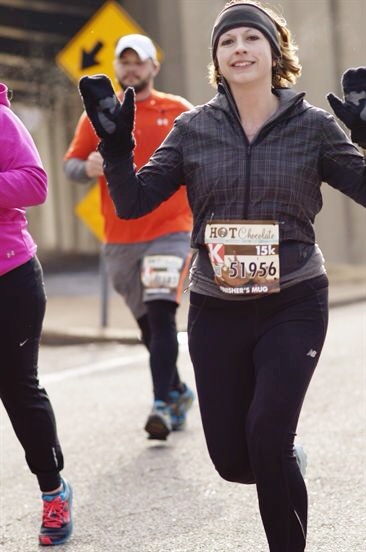 Again, I did not run the whole race with my hands up. I promise. Am I staring at the ground again? Maybe I’m just blinking. 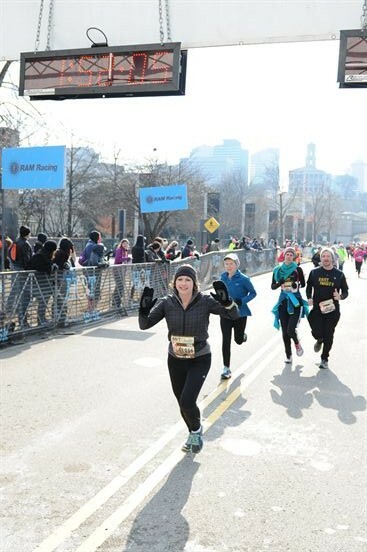 I have got to perfect these finish line photos. 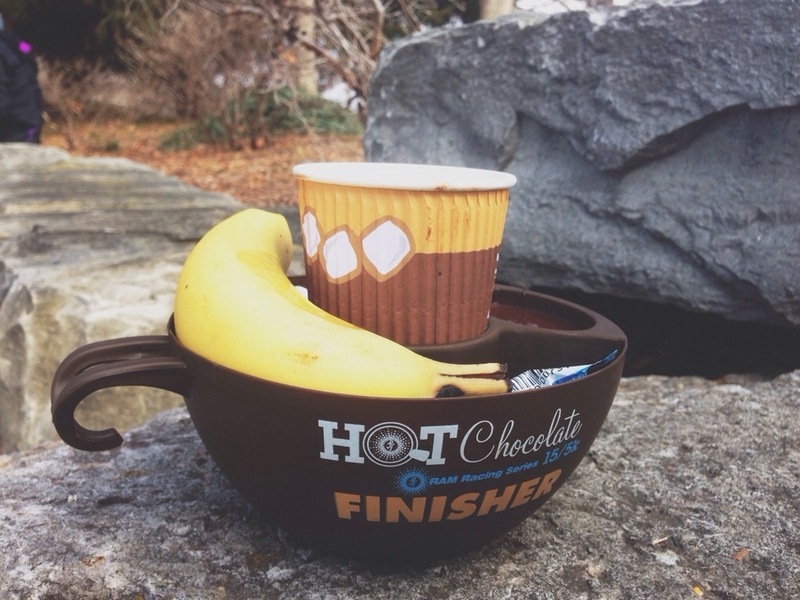 I picked up my souvenir race mug, which had hot chocolate, a banana, and chocolate fondue with wafers, marshmallows, pretzels, and a rice krispie treat to dip. I sat down and ate my banana, but I was soon becoming very, very cold again. So I downed my hot chocolate and hightailed it back to my car, saving the fondue for when I got home. I chose the perfect outfit to run this in. My hands got sweaty occasionally, but I would just take my mittens off and put them in my jacket pocket until my hands got cold again. The zippers on both my jacket and shirt allowed me to use them as a kind of thermostat. 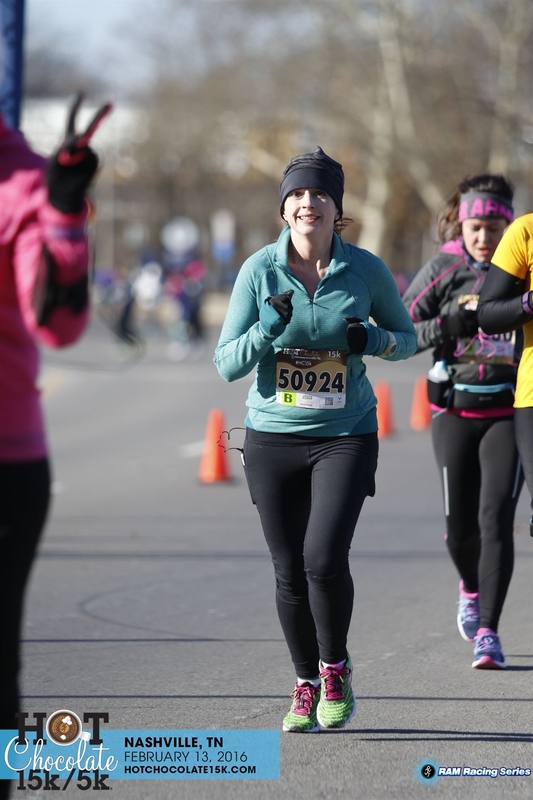 I felt completely comfortable despite the 20 degree temperature throughout the entire race. For the timed splits, the first one was at 3 miles (not quite to the 5k mark for some reason) and the second was at the 10k point. Even if that 5k time was recorded on a downhill, I have to be able to run a 5k at that speed if I can do it at the end of a 15k, right? 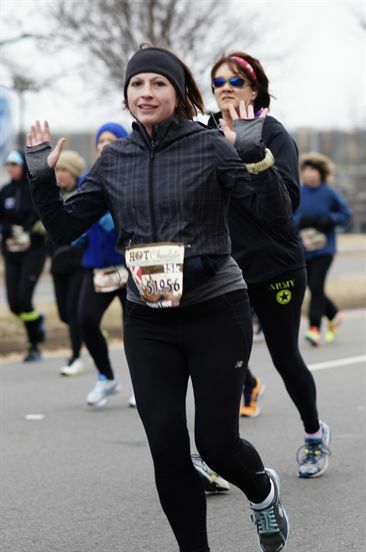 All on-course photos by Souvenir Photography.